Next Italy Beadventure: September 9-22, 2019 to Malta & Sicily with Sabine Lippert! A note from Maggie about this Beadventure . 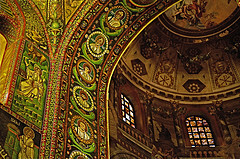 . .
“I initially developed this trip based on my love of Ravenna and its mosaics. My research of the region took me further into the Emilia Romagna region in which I discovered so much more about its history, cuisine, and culture. The group so enjoyed our Beadventure to this region earlier this year, we decided to again offer it. During our Beadventure we will start out in Venice, then visit the cities of Ravenna (a UNESCO Heritage Site), Bologna (home to the oldest university in Western Europe), Modena, and the Parma region, world-renowned for its Parma ham, parmesan cheese, and balsamic vinegar to name just a few foods. 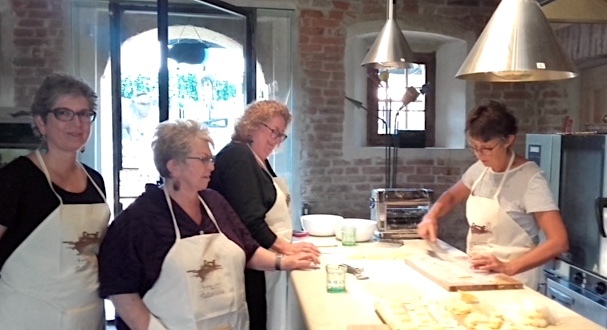 I hope you will join me on this new itinerary as we experience together the beautiful Emilia Romagna region in Northern Italy." Day 1. Wednesday, October 10. Arrive in Venice. Today you’ll fly into t he Venice Marco Polo Airport (VCE). 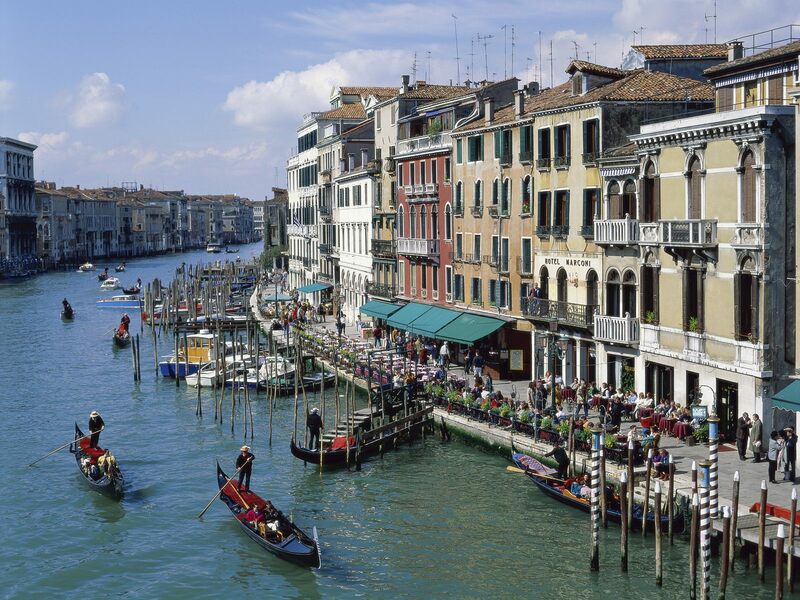 From the airport you’ll take a water taxi to Murano to our conveniently located, new contemporary hotel where Maggie will be waiting to greet you upon arrival. We will meet up in early evening during which Maggie will give you an overview of the island and itinerary, and Heather will talk about the group’s project. Because everyone will b e tired from travelling, dinner will be on your own. Day 2. Thursday, October 11. 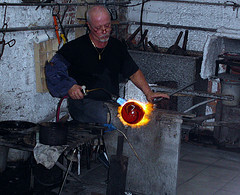 Explore Murano/Workshop. The morning is open to exploring Murano’s historical spots, glass museum, and of course, shopping. In the afternoon, we will gather to begin our workshop; in the evening we will have our welcome dinner. Day 3. Friday, October 12. Venice. In the morning, we will take the Vaporetto (water taxi) to Venice to meet our wonderful guide Mariangela, who also is a great storyteller, for our tour. In addition to learning about the Venetian history and culture, Maggie and Mariangela are working on places to visit tailored to our interests, such as Carnivale costumes and mask-making. In the afternoon, we will have lunch (included) and the rest of the day will be yours to further explore Venice on your own. Day 4. Saturday, October 13. Workshop. We will continue with our workshop in the morning; the afternoon will be free to further tour Murano, return to Venice, or see other sites such as Burano, known for its lace-making. Day 5. Sunday, October 14. Travel to Ravenna. Today we will drive to Ravenna, located in the Emilia Romagna region and one of Maggie’s favorite cities in Italy. Ravenna is known for its well-preserved late Roman and Byzantine architecture, and has eight UNESCO world heritage sites. Ravenna has beautiful architecture, world-renown mosaics, shopping, and is very easy to get around. We will get settled into our rooms, which will be followed by an orientation to the city by Maggie. 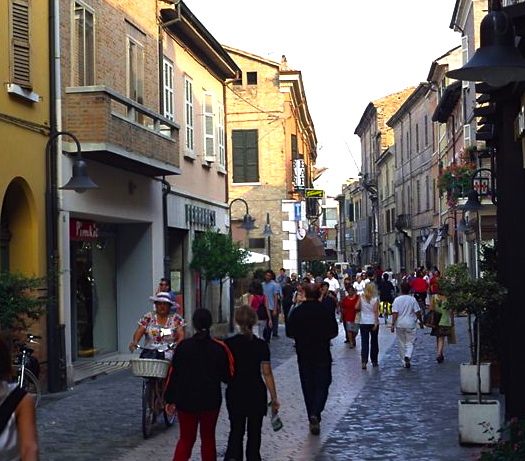 You’ll then have some time to check out Ravenna before dinner at one of the local restaurants. Day 6. Monday, October 15. Tour Ferrara. After breakfast, we will travel to Ferrara where we will meet our guide for a walking tour of the city’s historic section (Ferrara has been compared to Florence but on a smaller scale with fewer tourists!). The town has broad streets and numerous palaces dating from the 14th and 15th centuries, when it hosted the court of the House of Este. For its beauty and cultural importance, it has been qualified by UNESCO as a World Heritage Site. 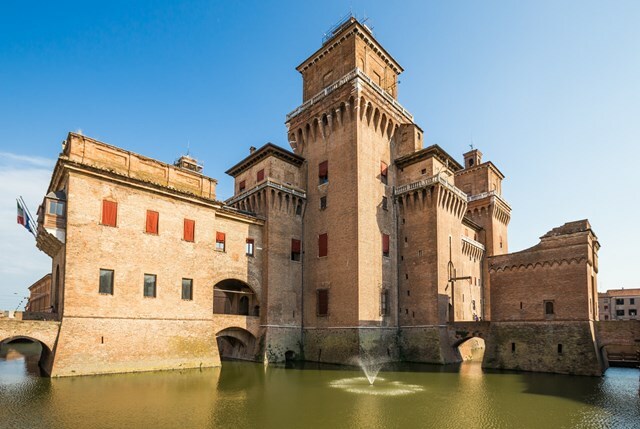 Following our tour, we will have a group lunch (included) and the afternoon will be yours to further explore Ferrara. Sunday is usually a great small market day in many towns. In the late afternoon, we will return to our hotel in Ravenna. Day 7. Tuesday, October 16. Experience Ravenna. In the morning, we will have a tour of Ravenna with our guide Manuela, a well-known mosaic historian. We will visit many of the places that make Ravenna a UNESCO World Heritage site. The afternoon will be free to further explore Ravenna (including shopping--Ravenna has some wonderful opportunities, whether it is for souvenir gifts, great clothes, linens, or shoes, to name a few things!). Day 8. Wednesday, October 17. Sightsee in Bologna. We will travel to and from Bologna by train. Once we arrive in the morning, we will have a tour with our fabulous guide Paola in which she will share some of this intriguing city's sites and have lunch at a local restaurant to sample Bolognese cuisine. Cuisine in the Emilia Romagna area is very different from the other regions in Italy—and the food markets are great! The afternoon is free to explore; Maggie will share ideas about some optional things you might do, such as a vinegar tasting (remember, we are in the heart of balsamic vinegars!). Day 9. Thursday, October 18: Travel to the Parma Countryside. Today we will drive about 3 hours to the final home for our Beadventure, Antica Corte Pallavacina, a beautiful family-run historical castle (part of the Castella di Ducati castles in the Po Valley region). After getting settled in our rooms, we will have a tour of the castle and its underground cellars where Chef Massimo Spigaroli ages his world- renowned culatello--one of the most prized salumi in Italy (mentions of this delicacy date back to the 15th century). Chef Spigaroli’s cellars make culatello for the rich and famous—from world renown fashion designers to political leaders, such as Prince Charles. We also will learn about his production of Parmesan Cheese. Optional cooking classes also are available during our stay. Day 10. Friday, October 19. Workshop. 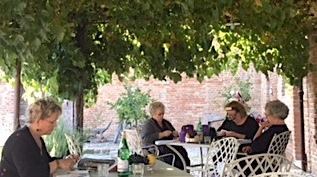 Antica Corte Pallavacina is the perfect setting to continue with our full day workshop on the patio under the trellis covered with grapevines (weather permitting). 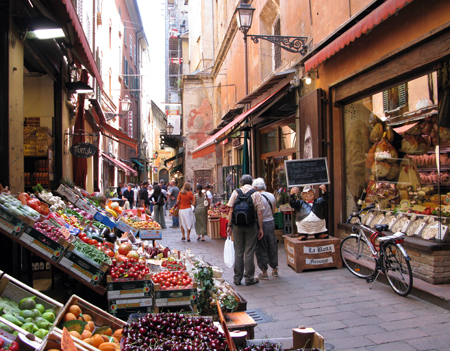 For a break, you can consider a stroll along the Po River or carve out some time to take a cooking class! Day 11. Saturday, October 20. Workshop / Tour of Castles. We can continue to bead or for those interested, we can do a driving tour of castles located nearby. Our farewell dinner will be at Chef Spigaroli’s Michelin-star restaurant on the premises—an experience not to be missed! Day 12. Sunday, October 21. Return to Venice. We’ll depart late morning for our drive back to Venice, where we will stay at a hotel near the airport, which will facilitate tomorrow's departures. Day 13. Monday, October 22. Depart. All good things must come to an end. Today you’ll depart for home or further travels. Note: The itinerary may be tweaked as new opportunities present themselves--be assured any change will result in an even better experience! About Heather's Project . . . "Luciana"
Inspired by a moonlit gondola ride, a crystal encrusted spiral ripples from a moon soft center of gleaming Swarovski pearls. Heather’s project is a subtle and glittering confection of seed beads and crystals, worked in a mix of albion stitch, right angle weave, and simple fringing. The three dimensional central motif is enhanced with Swarovski briolettes and tiny crystals. The pendants are a delicious mix of crystals and Swarovski pearls. 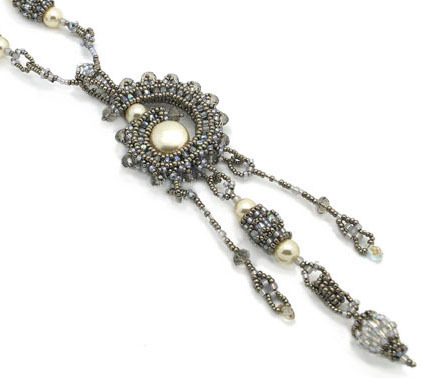 The necklace section includes more beaded beads and a dainty beaded chain. Heather’s kits will include everything you need to create Luciana; and you will have a choice of three colorways--antique silver, vintage champagne, or aged bronze. As a special treat Heather also is preparing a treasure box with a special bonus project--a bead embroidery cuff that is inspired by the stunning costumes and masks that have been made famous by the Venice Carnival. Different from other carnivals in the world. Most costumes refer to the attire of the Venetian noblemen and women from the past and often are excessively decorated with lots of attention for detail. It's that "excessive decoration" that provides inspiration for this project! 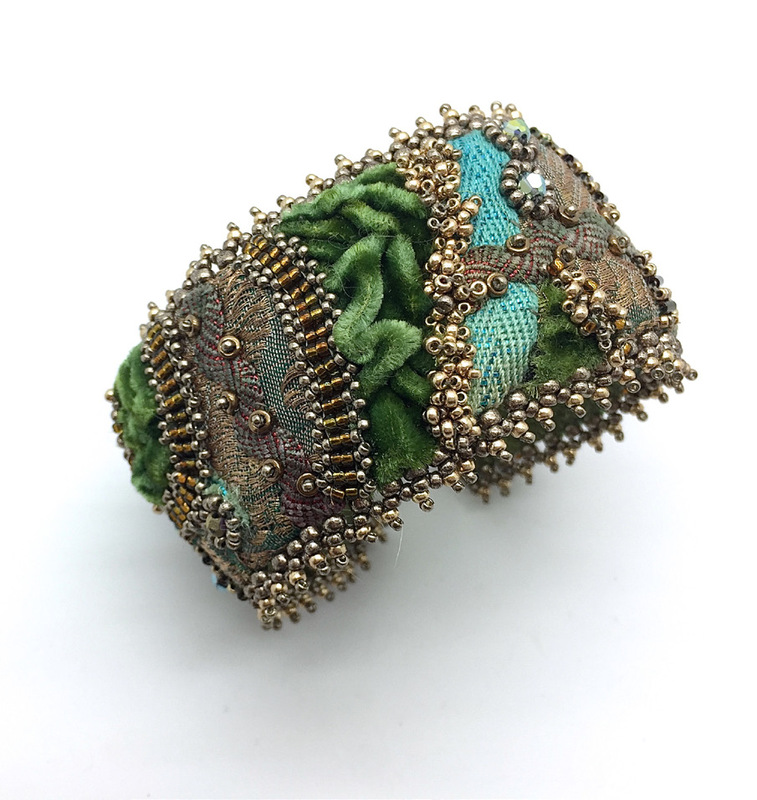 Your treasure box will have all the materials and instructions you need to create a patchwork cuff covered with silk, silk velvet, and ribbon snippets embellished with beads and crystals. The closure is a set of elastic loops and beaded buttons. The inside is metallic faux leather; the finishing touch is a beaded edging. Plus you'll be able to look for your own inspiration for the project as you walk the winding alley ways of Venice. About Heather Kingsley-Heath, your workshop instructor . 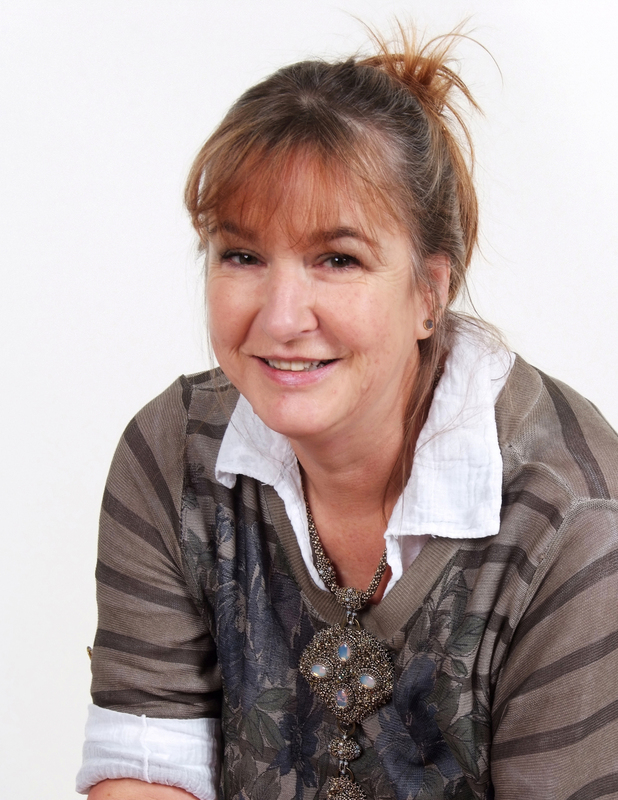 . .
Heather is an English beadwork artist who teaches nationally and internationally. 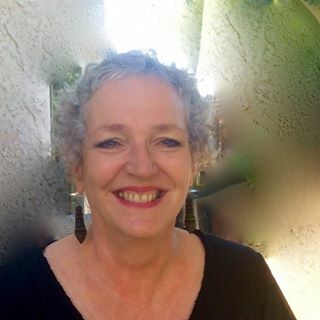 She teaches at Milwaukee, Wisconsin’s Bead&Button Show; Beader’s Best in Hamburg, Germany; the UK’s Big Bead Show; and Das Perlament in Cologne, Germany. She is the current UK Ambassador for National Beading Week. Heather’s love of beads and color is infectious and she has inspired and encouraged many budding designers. Her beaded jewelry is delicate, richly detailed and infinitely wearable. With designs inspired by history, heritage, vintage and treasure, her work explores the relationships between wearer and object. Heather is also known for her more experimental figurative and sculptural pieces which combine a huge range of seed beading techniques with magical wizardry to create three dimensional pieces inspired by nature and her English garden. To learn more about Heather and her work, visit her website. About Maggie Meister, your tour leader . . .
"The love of ancient history, color and patterns have followed me throughout my life and my designs have come to fruition during the time my family and I lived in Italy. In looking back, beads have always been a part of my life – from playing with Mardi Gras beads or collecting semi-precious stones as a young girl to my love of ancient and ethnic jewelry as I became older. Today seed beads have become the medium I use to translate my sources of inspiration into personal designs for adornment. In addition to teaching around the United States, Maggie leads Beadventures to Italy each year. Her book, "Classical Elegance," was released in August 2011. Her work was featured in the October 2012 issue of Ornament magazine and Maggie was a 2013 “Designer of the Year” for Beadwork Magazine. Learn more about Maggie and her work at her gallery. There is a great deal of walking on this trip, much of it up and down hills, on uneven cobblestone streets, as well as stairs as most places do not have elevators. As a result, this trip is not for people who have difficulty walking or other mobility issues. Bring your customary supplies, bead mat, and a battery powered task light.